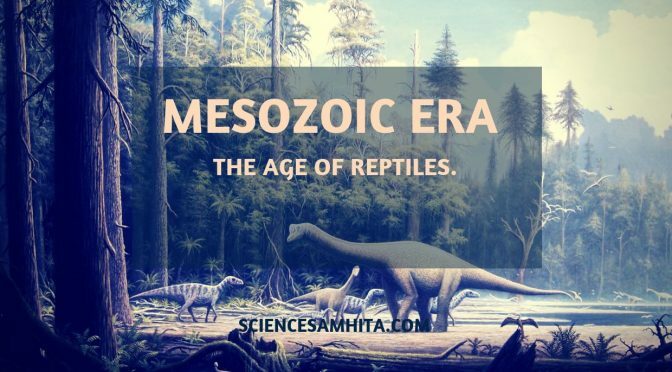 The Mesozoic Era started about 225 million years prior to the present era, the amphibians were declining after a long period of supremacy among the animals and the reptiles were gradually replacing them. Many of them became very large fearsome and came to dominate the animal life practically everywhere. As a result, giant reptiles, dinosaurs, and other monstrous beasts become very abundant and spread into all habitats. For this reason, the Mesozoic era is also called the Age of Reptiles or the Age of Dinosaurs. The Mesozoic Era spans from about 252 million years ago to about 66 million years ago that means it began roughly around the time of the end-Permian extinction. The name “Mesozoic” was proposed in 1840 by the British geologist John Phillips (1800–1874). This era is also known as “Middle Life” era. The era is subdivided into three major periods: the Triassic, Jurassic, and Cretaceous, which are further subdivided into a number of epochs and stages. The Thunder lizard or Brontosaurus was a large, long-necked quadrupedal animal with a long, whip-like tail, and forelimbs that were slightly shorter than their hindlimbs. The largest species weighed up to 15 tonnes and measured up to 25 meters long from head to tail and its height was 4.5 meter. It has a very long neck which was equally balanced by a long and heavy tail. It was the largest reptile at that time. The Tyrant lizard or Tyrannosaurus walked on the enlarged hind limbs. Its forelimbs were reduced and the tail was heavy to counterbalance. Tyrannosaurus rex was perhaps the largest carnivores in its environment. It was most likely an apex predator, preying upon hadrosaurs, armored herbivores like ceratopsians and ankylosaurs, and possibly sauropods. The Plated lizard or Stegosaurus had a distinctive double row of bony plates rising vertically along the rounded back and paired spikes extending horizontally near the end of the tail. The function of these plates and spikes has been the subject of much speculation among scientists. Today, it is generally agreed that their spiked tails were most likely used for defense against predators, while their plates may have been used primarily for display, and secondarily for thermoregulatory functions. The anatomy of Pterosaurs was highly modified from their reptilian ancestors by the adaption to flight. Pterosaur bones were hollow and air-filled, like the bones of birds. They had a keeled breastbone that was developed for the attachment of flight muscles and an enlarged brain that shows specialized features associated with flight. They also possessed lateral skin folds, each supported by an elongated fourth finger. The fifth finger was lost and rest three were used for clinging to the cliffs. Elasmosaurus had a streamlined body with paddle-like limbs, a short tail, a small head, and an extremely long neck. They were well adapted for aquatic life and used their flippers for swimming. Elasmosaurus is a genus of Plesiosaurus and was about 15 meters long. Ophthalmosaurus had a graceful 6 m (19.5 ft) long dolphin-shaped body, and its almost toothless jaw was well adapted for catching squid. It had fish like limbs and even a structure looking like a dorsal fin. Ophthalmosaurus was a sea-dwelling ichthyosaur, about 2.1 meters long. Cynognathus had a mammal-like appearance. Limbs were beneath the trunk to provide better support and more rapid back and forth movement. Teeth were heterodont, being specialized for cropping, stabbing, cutting and grinding. Also Read: Why Nature Preferred DNA over RNA? The reasons for the evolution of large size are not entirely clear. There must have been ample food for them to maintain such a huge size. Moreover, large size has some advantages such as better protection from enemies and also offers less surface area per unit mass, thus less absorption and radiation of heat. The number of reptiles started decreasing toward the end of the Cretaceous period (70-100 million years ago) and the majority of reptiles disappeared. The modern or living reptiles are a mere fraction of their prehistoric flourishing predecessors. They form only 4 orders as against 14 orders of the Mesozoic Reptiles. The reasons for their extinction are also not fully known. No single factor can be assumed as the reason because the groups in totally different environments vanished. A combination of factors such as climatic and ecological factors, poor mental development, poor reproductive rate etc. may have been possible for their extinction. However, most scientists agree that an asteroid impact wiped out the dinosaurs at the end of the Cretaceous Period. The impact would have kicked up so much dust that it blocked the sun, halted photosynthesis, and caused a huge disruption in the food chain. Lizard and Snakes evolved in dense forests and rocky area. As it provided good cover from predators. Crocodiles, because of their large size and natural defense, found no enemy. Also Read: What is Speciation? Ghose, T. (2015). Mesozoic Era: Age of the Dinosaurs. Live Science. Available at: https://www.livescience.com/38596-mesozoic-era.html. En.wikipedia.org. (2018). Mesozoic. Available at: https://en.wikipedia.org/wiki/Mesozoic. En.wikipedia.org. (2018). Brontosaurus. Available at: https://en.wikipedia.org/wiki/Brontosaurus. Previous PostSexual Reproduction – An Important Innovation of the Early Protists.​Next PostHow do Auxins affect Plant growth?